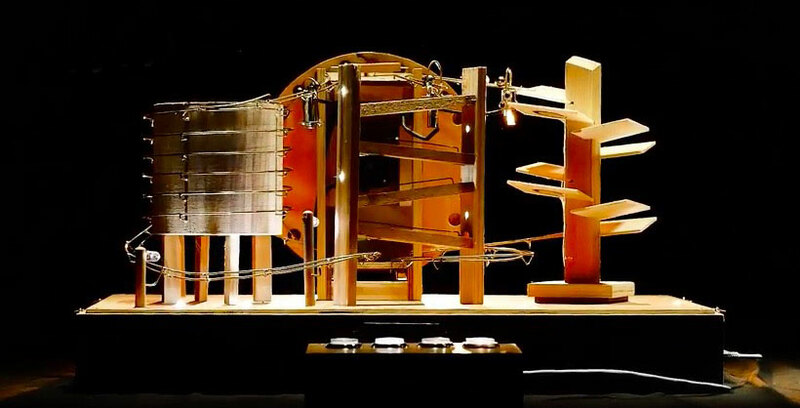 Les Boites Mécaniques are a set of four automated boxes that produce music out of wood and metal. These experimental instruments enable anyone to explore the magic of making sound by pressing buttons on a remote, which activate each respective device to vibrate, knock, and rub materials. The boxes were developed by Kogumi‘s Anatole Buttin and Yan Godat for educational electronic music workshops, and can be played either solo or in unison. There’s even a mode that allows users to control it all via MIDI notes on a computer. In terms of hardware, each box is equipped with an Arduino Uno, a TLC59711 LED driver, step motors with AccelStepper library and a 3D-printed microstep driver. You can watch how it all comes together to create a unique sound below! [Rjeuch] liked a wooden clock he saw on the Internet, but the gears were produced with a proprietary software tool. So he built his own version. Unlike the original, however, he chose to use a stepper motor to drive the hands. The clock’s gears aren’t just for show, and the post does a good job explaining how the gears work, how you might customize them, and how they fit together. The clock’s electronics rely on an Arduino. The issue with an Arduino, of course, is that the time base isn’t always good enough to keep time over long periods. To fix that problem [Rjeuch] used a ChronoDot which is a real-time clock that uses temperature compensation and claims to be accurate to a minute a year. Of course, no plan goes off without a hitch. Owing to bad stepper mode specs, the original version of the clock was gaining time overnight. Although the stepper claimed to have a 1:64 reduction gear, the actual ratio wasn’t that precise ([Rjeuch] estimates it as 1:63.876. The steps he took to fix this are worth a read. You can see a video of the clock below. We’ve seen lots of other clocks, of course. Some of them even make this one looks simple. The post Explore This Elegant Wooden Arduino Puzzle Box appeared first on Make: DIY Projects, How-Tos, Electronics, Crafts and Ideas for Makers. An Interaction and Industrial Designer studying at Carnegie Mellon University in Pittsburgh tried to re-imagine the way we interact with radios to create a more meaningful relationship between the user and the artefact. Radios have been around since the 1920s but the devices we have at home haven’t changed much even if they were designed nearly 100 years ago and share similar elements like switches, knobs, sliders. When The Experimental Form Radio is laying on a tabletop, it is off. 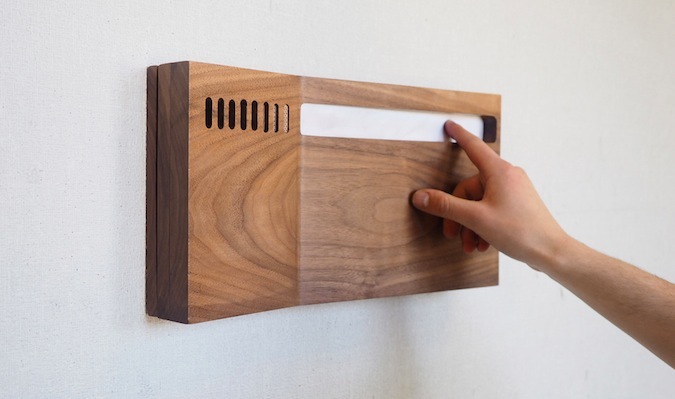 To turn the radio on, you pick it up and slot it onto a wall mount. The radio leverages the elastic qualities of fabric to control stations and volume. To change stations you press lightly and slide your finger along the fabric surface. To change the volume you press firmly into the fabric, and then slide your finger along the deeper cavity in the radio. The video below showcases the interaction. Requiring the user to pick up and wall mount the radio to turn on creates a ritualistic experience with a very simple feedback mechanism. If the radio is hanging on the wall it’s on, if the radio is laying on a flat surface then it’s off. The visual and auditory feedback allows the user to have a clear understanding of the system state. The project uses an Arduino Uno board with a custom circuit made with three independent layers of conductive fabric and conductive thread. Touching together two layers of conductive fabric completes one of twelve circuits that then either change the radio station or the volume. Take a look at the additional documentation on his website. “Years” is an artwork created by Bartholomäus Traubeck that translates wood’s year rings into sound. The record player uses a system that analyse tree’s years for their strength, thickness and rate of growth. This data are mapped to a scale defined by the overall appearance of the wood and serves as basis for a generative process that outputs piano music. The system is composed by arduino, ps eye, stepper motor for moving the tonearm, vvvv and ableton live, all connected via midiyoke and/or serial.